meghan eats local: What Do Zombies and 93% of American Adults Have in Common? What Do Zombies and 93% of American Adults Have in Common? I recently started watching Season 1 of the AMC series The Walking Dead, which, to the detriment of my productivity, is available on Netflix. And slightly more recently (today), I finished it. On to Season 2, once Erin gets home from her dinner party. If you think I’m watching this terrifying show at night in my rickety, old, definitely-not-zombie-proof cottage without my 105-pound, mild-mannered roommate to protect me, you’re crazy. I have to admit I watch most of the gory scenes (and there are quite a few) through my fingers. 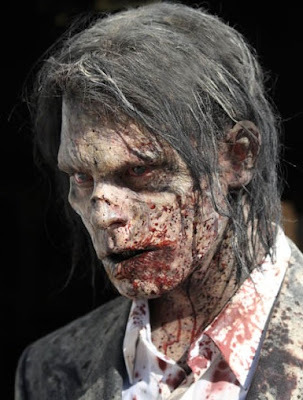 The goriest moments include the human characters hacking up dead bodies and the zombies (or “walkers,” as the show refers to them) tearing into and devouring humans and animals indiscriminately. I haven’t gotten to Episode 6 of the second season yet, but I hear it involves a zombie massacre in a barn. It got me thinking and I came to a couple of (completely useless) conclusions. First, I want to be one of the extras who gets to play a zombie. I have the right skin tone so they wouldn’t need much makeup other than to make it appear as if my face is decaying and falling off. Second, in a zombie apocalypse, pretty much everyone would become an almost-vegan. There just wouldn’t be any non-perishable animal-based food to be had, other than candy and bread products. The human characters in The Walking Dead eat fish and squirrels when they can get their hands on them (who wouldn't? It’s a freaking zombie apocalypse), but most of the large animals have been eaten by zombies. That brings me to my third observation. Those zombies don’t discriminate: they eat any living thing, from humans (of course) to horses, deer, barn animals, and dogs. It’s not even clear that they prefer human flesh to that of other animals; when the characters come across a zombie tearing into an animal, it’s not like the zombie loses interest in the animal and starts chasing the humans instead. And the producers don’t discriminate, either: they amp up the gore just as much when a group of zombies is digging into a dog torso as they do when it’s a human getting nommed on. As I watched a zombie unraveling a horse’s intestines, it occurred to me that this scene was meant to be disgusting to all viewers. But why should meat eaters be disgusted by the eating of animal flesh? They eat that stuff, too. And at least zombies eat the whole animal, not letting any of it go to waste. It’s not that I’m comparing meat eaters to zombies, but… yeah, I’m comparing meat eaters to zombies. Way to have more things in common with zombies than I do, guys. "But why should meat eaters be disgusted by the eating of animal flesh?" I don't think we are disgusted by the eating of animal flesh as we are by the eating of raw, uncleaned animal flesh. Humans register disgust to things likely to make them ill, like spoiled food, dead bodies, blood, feces, vomit, maggots, etc, or just digging into a horse with your teeth. Even people who love sushi (myself included) would probably not be okay with just biting into a fish that you pull out of the river the way Gollum does in Lord of the Rings. Those scenes ARE meant to be disgusting to all viewers because disgust is a universal, visceral reaction to something is dangerous or undesirable from an evolutionary perspective. We probably would be just as disgusted by tofu covered in mold. This is actually a fascinating explanation... and pretty accurate. I'm not disgusted by raw meat, but I am if it is out in the sun, dirty, etc.... in conditions that would probably make me sick if I ate it. Thanks science! Meghan, your point still stands... I am more of a zombie than you. Mostly because of how terrible and groggy I act when I wake up.... and because I eat human braaaains. can you please tell me why humans have K9's?